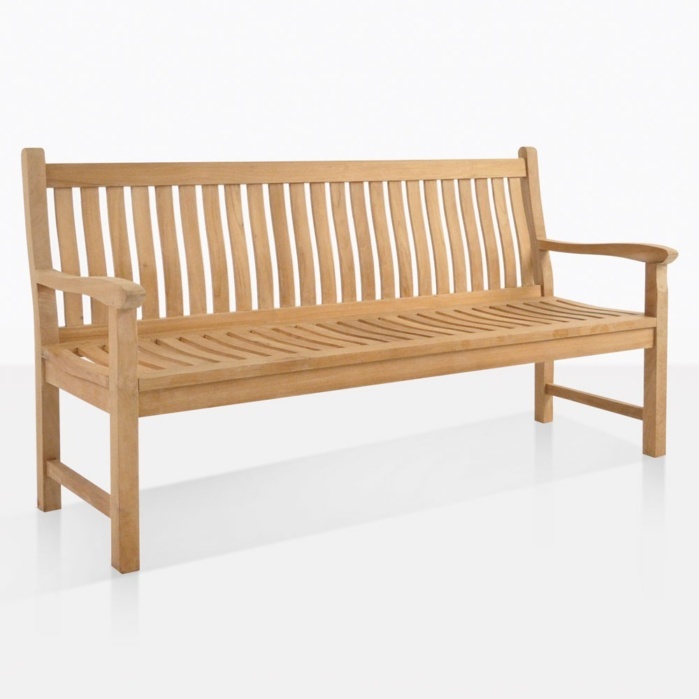 Classic, dashing and stylish; the simple design of the Wave Teak Outdoor Bench (3 Seat) coupled with its extra-comfortable framing will have you outside for hours on end! The largest member of the Wave Collection; the Wave Teak Outdoor Bench (3 Seat) at a whopping 71 inches long, ensuring that everyone gets a seat at your house! Timeless and ergonomic, this Wave Collection is among our most popular styles because of its solid teak frame, and divine, curved slats which support the back and base of each person who relaxes into it, and also creates a pleasing look that you will enjoy for years to come! 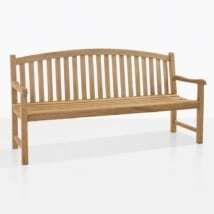 L71" x D25" x H38"
The Wave Teak Outdoor Bench (3 Seat) is made out of none other than A-Grade Teak – our signature product at Teak Warehouse! For over 20 years, we have been supplying our customers with this divine product, because no other wood in the world creates such beautiful looking furniture that can stand the test of time in the great outdoors. 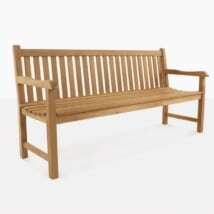 This particular grade of teak is proven to outlast lesser grades. The ‘A’ is only given when the tree has grown and aged to a certain level, meaning that it has had time to produce its own levels of rubber and oil throughout. This is a wood that will look and feel stunning for years to come, as well as being ridiculously easy to maintain! A-Grade Teak will patina to a pretty gray/silver color, if you prefer the honey color investigate marine grade oils and/or sealants. Regardless of your preference, a simple clean with Simple Green is the answer! Use something non-abrasive like this marvelous, great smelling product in a bucket of warm water, follow the grain of the wood with a sponge or brush and 5 minutes later your piece will be looking fabulous! 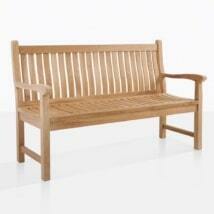 A-Grade Teak is just one of the many marine quality products we have at Teak Warehouse – don’t let the name fool you! We also carry products that feature #316 Stainless Steel, Powder Coated Aluminium, Batyline® and Textilene® Mesh, Sunbrella® fabrics, Raw Concrete and Reclaimed Teak in a vast variety of different items for your great outdoors! 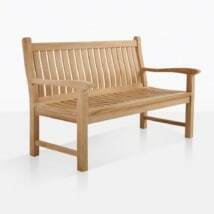 As well as the momentous Wave Teak Outdoor Bench (3 Seat), we also carry a 2 and 2.5 Seater Bench and the Wave Dining Chairs in a Arm and Side! Create fluidity in your outdoor area with a large Hampton style Table with Wave Dining Chairs around one side, a Arm at either end, and a gorgeous Wave Teak Outdoor Bench (3 Seat) on the other side of your space, for when you want to rest after that big meal! Make a safe, tranquil haven in your garden with two of the Wave Teak Outdoor Benches (3 Seat,) add a couple of Raw Concrete Stools or Side Tables for a hint at modern sensibilities and relax into the comfort of your own surroundings! Grab a throw cushion for each bench and lay out with a friend, watching the world go by in this comfortable and timeless bench. 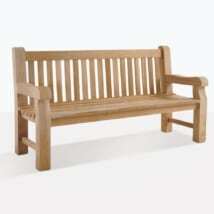 The Wave Teak Outdoor Bench (3 Seat) is made out of our signature product A-Grade Teak; sustainable, durable and long lasting. You will be proud to have this beautiful piece furniture in your beautiful home.